Do you love street food? I do too! Admittedly, we are not the quintessence of wanderlust. But when we do travel, eating street food and eating at small eateries is more appealing than dining at upscale restaurants. May be because you can tantalizingly actually smell and see the local food cooked in front of your eyes as you pass by . Not to mention the sight of gastronomic delight on the faces of the folk devouring these delectables. So easy to make a beeline for the same, never mind if you have eaten your last meal just an hour ago. Taste is paramount, let's think about the hygiene aspect later. That's street food for you. You can ask for your plate to be custom-made, less oil in the dosa, extra garlic chutney, 'extra spicy' or a little of both 'khatta and meetha' in your pani puri'. The vendor is in his element as he briskly puts the order together. He is a specialist and Chef in his own right. Obliges most of the times for the customer. Now street food is even more popular with the show - Highway On My Plate. I envy those guys for actually getting paid to eat (wow, wow!!) all the street food across the country. Mayur, specially, for eating and still looking fit! Every region and city has its unique street food. Lip-smacking chaats, Kaati rolls, rasgollas of Calcutta, the numerous idli-dosa joints of Chennai, the grub on Parathewali Gali in Delhi, North Karnataka' s Mandakki Churmuri, Girmit and Menasinakayi (batter-coated deep-fried green chillies). In Bangalore, Calcutta wala's pani-puri, dose camp dosas, chur-muri, and tomato masala beckon. And how do we forget Mumbai? Vada-pav, missal, dabeli, faloodas, chaats, cutting chai, fusion food... Add another specialty rice dish Tawa Pulav. Cooked rice, vegetables, pav-bhaji masala and other spices sauteed over a tawa (griddle), heated up in a jiffy over the raging flames and ladled on to the waiting plate. And on to the hands of the very...ahem... eager eater... etiquette stops us from literally grabbing the plate from the vendor. We are salivating, badly. Blame the visual appeal and assault of aroma of food being cooked within inches of your face and...mouth! Now am sure, as with a lot of food, this dish has variations as well and names too. I saw this on Supriya's Red Chillies, and the dish had to be tried. Like her, I too thought that Pav Bhaji masala is meant for use only in Pav Bhaji. As it turns out, Pav Bhaji masala and tomato sauce in Tawa Pulav do make this one delicious and zara hatke (off-beat) kind of rice. Ever so slightly sweet, slightly tangy and spicy, with bits of succulent paneer and the crunch of capsicum does make this a delicious dish indeed. Perfect to entertain guests on short notice or even for a bunch of kiddos - now show me a kid who can resist a combo of paneer and tomato sauce. I have made this about 4 times now, this being an easy preparation guaranteed to please most palates. Goes without saying that one key factor for this dish to taste its best, is perfectly cooked rice. I have used Basmati, cooked the rice directly in a heavy bottomed pan. If you cook directly in the pressure cooker, you may need to use less of water.You could use regular rice too. You could also use left over rice. Procedure : Cook and cool the rice completely. Heat the oil in a broad, heavy pan. Add the cumin, saute till it changes color. Add the grated ginger, garlic, saute for a couple of minutes, take care not to let it brown. Tip in the peas, onions and tomato, turmeric powder. Once the tomato is cooked, add the red chilli powder, pav bhaji masala, sauce Add the paneer and the capsicum. Heat gently for a couple of minutes. Add the rice and salt to taste. Go easy on the salt. Mix gently but thoroughly. Heat through, covered. I do not like to heat this for long as I like the slight moisture from the sauce and tomato. If heated long, the moisture will be gone, the paneer may become slightly chewy. Garnish with chopped coriander. Serve hot. Please note: Supriya uses more sauce in the recipe. More sauce will make the rice sweeter, but please do go by your taste. I would add not more than 2-3 tablespoons of sauce for the above quantity. Try this out for yourself, you are sure to make it again and again. Thanks Supriya for sharing this recipe, it sure is a great one! 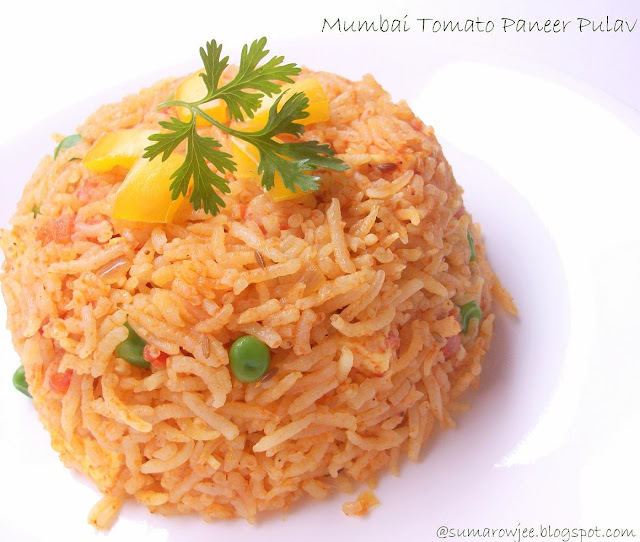 Tomato paneer pulav looks super delicious and absolutely flavourful. wow... looks so mouthwatering...ur clicks r so amazing ! 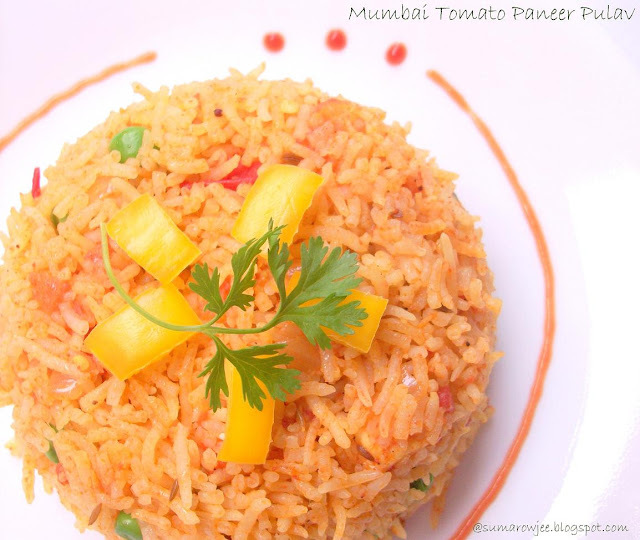 The tawa pulao looks great... mouthwatering! wow..this looks awesome..would love to have some..YUMMY YUMMY..
Thats such a flavourful and delicious pulao. Thanks so much for trying this and glad you liked it, Suma.